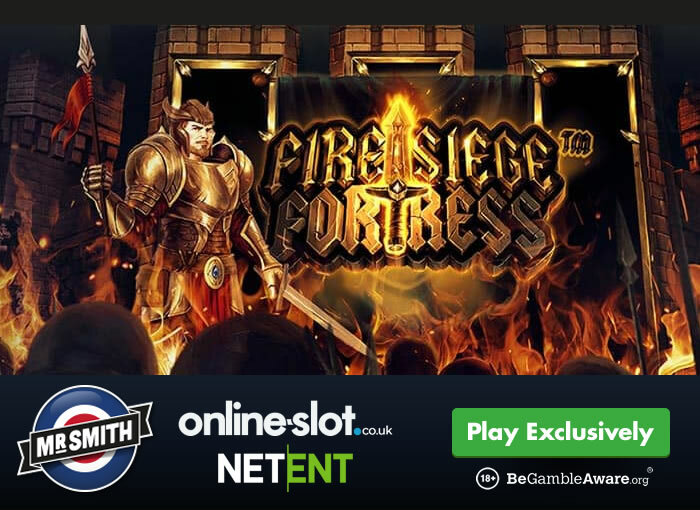 Mr Smith Casino sometimes exclusively releases upcoming NetEnt slots early with Fire Siege Fortress being available right now. The software giant, Net Entertainment, has released plenty of slots exclusively early at Mr Smith Casino including Wolf Cub and Blood Suckers II which are now available everywhere. At present, both Moonshine Riches and Coins of Egypt (from NetEnt) can only be played at Mr Smith Casino. Anyway, Fire Siege Fortress comes with 5 reels and 576 ways to win. Playable from just 20p a spin across desktop, mobile and tablet devices, medieval mayhem awaits as you enter a world of knights and dragons as you take on fortress cities. Visually, it’s superb – as you’ve come to expect. This feature-packed offering comes with 3 wild window features which come into play when a wild symbol lands on any of the 3 middle reels. The Archer Attack feature sees up to 3 random wild symbols being added to the reels whilst the Dragon’s Breath feature sees an expanding wild on reel 3. The Trebuchet Assault feature sees up to 2 Giant Wilds added to the reels. You then have the Fire Free Spins feature where you can get 3 Fire free spins with the wild window features coming into play if a wild lands at the bottom of any of the 3 middle reels. You could also win a small cash prize if you trigger the Tower Coin Win feature. Fire Siege Fortress is all about the Fire Siege Free Spins feature where up to 18 fire siege free spins can be won – like the Fire Free Spins feature and base game, the 3 wild window features can trigger on every free spin meaning every free spin can benefit from random wilds, Giant Wilds and expanding wilds all at once! Medium to high variance, Fire Siege Fortress has the potential to give you wins of up to 3,456 times your stake on every spin/free spin! For full details, and to try for free, check out the Fire Siege Fortress slot review. As mentioned, Fire Siege Fortress can only at be played at Mr Smith Casino – with over 1,000 slots to their name, they have the latest games including ELK Studios’ Joker Gems, NextGen Gaming’s Kingdom’s Edge, Pragmatic Play’s Peking Luck and IGT’s Da Vinci Diamonds Masterworks.